As ornaments go I think that I am up there with the the best of them. 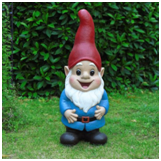 I should explain I am a garden Gnome and spend my days in the garden of my owner perched on the edge of the pond. Now some people would think that spending your days sitting in the garden in all weathers could be quite boring. It is in fact the complete opposite. I have a ring side seat to most of the goings on both inside and outside the house. You see where I stand puts me in prime position to keep an eye across the whole garden and I also have a straight-line view through the patio doors. Now I’m not alone here in the garden. There are a couple of us Gnomes here and a very self-absorbed weather vane who seems to think the whole world revolves around him. Ironic I know as he is the one who spins around with the wind! Other than that, our only other companions are the rabbits who live in a hutch in the corner of the garden and the various other wildlife that visits us from time to time. There is a pesky pigeon that sometimes visits the garden and likes to perch on my head. Its really rather annoying. Especially as she always does it during the day time. The time when it is particularly dangerous for me to start moving about. I’m sure that’s why she does it. Anyway, I wanted to tell you about this one particular day in the summer last year. There I was sat outside sunning myself when all of a sudden, a lot of squealing came from indoors and through the patio door I could see the oldest child jumping up and down hugging her mum and dad. She was turning 18 in a few weeks and it turns out mum and dad had decided to throw her a big party to celebrate. For weeks afterwards the muffled conversations I could hear coming from inside all seemed to surround who she was going to invite, the fact that she absolutely must have a new dress to wear and then hours and hours of conversation surrounding what theme it should be and what food they were going on serve. Then I heard the one thing filled me full of excitement. Mum had ordered her a ride on rodeo bull as entertainment for her party. You know what happens when people ride rodeo bulls don’t you – they fall off and for a Gnome sitting in the garden nothing could be more hilarious than watching a bunch of people, especially young people falling about all over the place. The garden was a buzz with the news and everyone became even more excited when the rabbits told us which rodeo bull manufacturer the humans had been looking at – http://www.gsrodeobulls.com/ no less. You should definitely take a look at what they have to offer and I will fill you in on all the gossip after little missy’s party in a few weeks time.